Das, P., Lakra, N., Nutan, K. K., Singla-Pareek, S. L. and Pareek, A. (2015). Pot Level Drought Stress Tolerance Assay in Tobacco through Plant Phenotyping and Antioxidant Assay. Bio-protocol 5(19): e1605. DOI: 10.21769/BioProtoc.1605. Drought is an important abiotic factor which has a huge detrimental impact on crop productivity. Study of plant responses towards drought stress and investigating the mechanism of drought tolerance is crucial for achieving the target of developing drought-tolerant plants. Phenotyping is a cost effective approach which can be adopted to evaluate the severity of drought stress in a plant. Next to phenotyping parameters, biochemical parameters such as the study of antioxidant enzyme activity play significant roles in assessing the extent of drought stress caused injury in a plant. Among the antioxidant enzymes, ascorbate peroxidase is an enzyme which plays a crucial role in drought tolerance in plants. It has been well established that the activity of this enzyme increases under drought stress. Here, we present a simple and reproducible protocol to investigate the response of tobacco plants towards drought stress through measurement of phenotypic parameters and antioxidant enzyme activity. Though, these experiments have been conducted with tobacco plants, this protocol could be adopted for other crop species. Note: The complete open reading frame of histone-gene binding protein of rice (OsHBP1b) was cloned at BglII and SpeI sites in the plant expression vector (pCAMBIA1304) and used for transformation of Agrobacterium strain (LBA 4404). Fifteen days old tobacco seedlings were used for transformation through tissue culture method. The putative transgenic T0 plants were transferred to the greenhouse for the purpose of seeds multiplication. The seeds of T2 transgenic lines were used for experimental purpose. Note: Currently, it is “CD Hightech Pvt. Ltd., model: APX175E ”. Imbibe wild type (WT) and transgenic tobacco seeds in distilled water for overnight. Allow twenty to twenty five seeds of tobacco to germinate on soil (equal quantity of agro peat and vermiculite should be mixed to prepare the soil) filled pots inside a growth chamber at 28 ± 1 °C with PPFD of 100 μmol/m2/s, a relative humidity of 75-80%, and a photoperiod of 12/12 h light/dark. Supplement 50 ml of MS media every day in the soil-filed pots to provide nutrition to the plants. Transfer two-week-old seedlings individually to separate soil-filled pots. Allow the WT and transgenic plants to grow up to 25 days for drought tolerance assay at pot level (Lakra et al., 2015). For drought treatment, prepare 5% PEG solution in MS media and supplement 100 ml of this solution to the pots individually, on a regular basis (once a day), for 5- or 10- days (Kumar et al., 2012; Lakra et al., 2015). Note: Polyethylene glycol or PEG is a flexible, water-soluble polymer, it can be used to create high osmotic pressures. These properties make PEG one of the most useful molecules for applying osmotic pressure in plants to induce water deficit stress. After 5 or 10 days of drought treatment, allow the plants to recover by supplementing 50 ml of MS media for 7 days and subsequently, carry out drought tolerance assay. Evaluation of drought stress in WT and transgenic tobacco can be done by analysis of phenotypic and biochemical parameters. As phenotypic parameters, number of yellow or green leaf, root length, shoot length, shoot fresh weight, root fresh weight, shoot dry weight and root dry weight of WT and transgenic tobacco plants can be considered (Lakra et al., 2015). As representative data, phenotype of WT and transgenic tobacco plants after drought stress has been shown here (Figure 1A). Measure the shoot and root lengths with the help of a scale. For shoot and root dry weight, cut shoot and root samples from the plant and dry them in an oven for 72 h. Subsequently, measure the dry weight of the samples through a weighing machine. Note: Use at least three individual lines from each type of plants for each experimental analysis. Analyse data for variance (ANOVA) by GraphPad InStat3 software. As biochemical parameter, ascorbate peroxidase (APX) activity can be measured through spectrophotometric method. As representative data, comparison of APX activity in WT and transgenic tobacco before and after drought stress has been shown (Figure 1B-C). Note: Under control (before drought stress) conditions no significant difference in APX activity was observed between WT and transgenic plants. For this purpose, weigh 100 mg of WT and transgenic tobacco leaf tissue and grind these separately using chilled motors and pestles (Figure 2A). Note: One may take young or old leaves, but, consistency should be maintained to take same aged leaves from each sample type. Supplement liquid nitrogen for fine crushing of tissue. Add 1 ml of potassium phosphate buffer (prepare fresh and keep at room temperature) immediately and then add 0.2 mM of PMSF to avoid protein degradation. Then transfer the homogenate (Figure 2B) to microcentrifuge tubes (Figure 2C) and centrifuge at 10,000 x g for 15 min. Maintain the temperature of the centrifuge machine at 4 °C. After centrifugation, the pellet and the clear supernatant will be visible (Figure 2D). 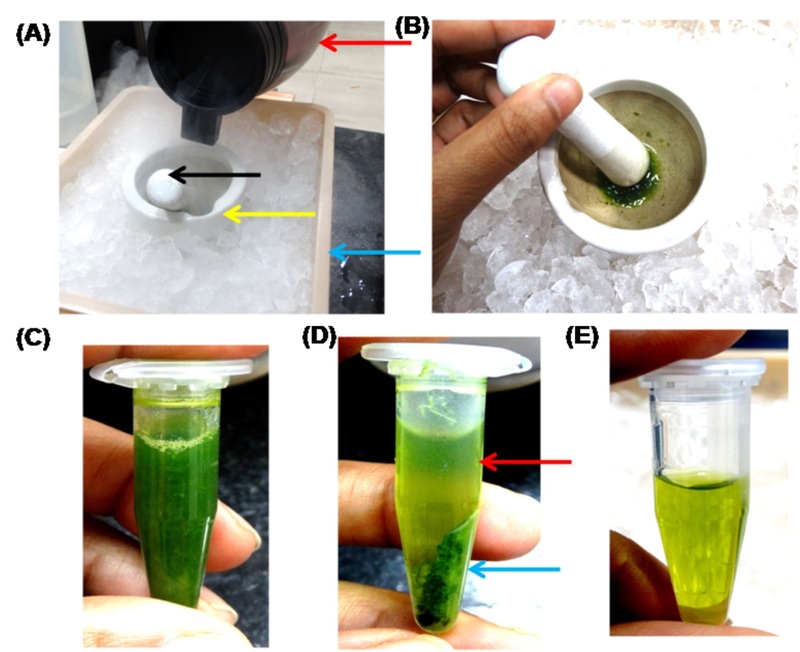 Subsequently, transfer the supernatant to fresh microcentrifuge tubes (Figure 2E) which will serve as crude protein/enzyme extract and will be used for APX activity assay. Measure the concentration of crude protein by using Bradford method (Bradford, 1976). Use BSA standard curve for protein quantification. Note: Previously prepared standard curve can be used here. For APX activity assay, use double beam spectrophotometer and quartz cuvette (Figure 3A and B). Prepare 1 ml of reaction mixture (sample) which will contain 50 mM K-PO4 buffer (pH 7.0), 10 µg crude enzyme extract and 0.35 mM ascorbate. Initiate the reaction by adding 5 µl of 10 mM H2O2. Note: H2O2 and ascorbate should be prepared in 50 mM K-PO4 buffer to maintain the buffer molarity. Reaction formula: The reaction initiates immediately upon addition of H2O2 where H2O2-dependent oxidation of ascorbate starts. The gradual decrease in absorbance can be visualized on the computer screen after initiation of the reaction. Use the reaction mixture without H2O2 as reference. Follow H2O2-dependent oxidation of ascorbate spectrophotometrically by recording the decrease in absorbance at 290 nm (€ = 2.8 mM-1 cm-1). Note: The reaction time is 120 sec and the reaction temperature is 20 °C. Here, slope value of absorbance in 290 nm (Δ OD s-1) from first 0.6 min is considered for rate calculation (Figure 4). Note: The slope of the best-fit line in this case is actually the product of the molar absorptivity constant and the path length (1.00 cm).Cary 300 UV-Vis instrument has the option to show the slope value of the graph. The activity of APX can be represented by the unit ‘µmol/min/mg protein’ or ‘µmol/min/g protein’. Figure 1. Plant Morphology and APX activity of WT and transgenic tobacco leaves following drought stress treatment and subsequent recovery. (A) Shows yellow and green leaves in WT and transgenic tobacco after drought stress. 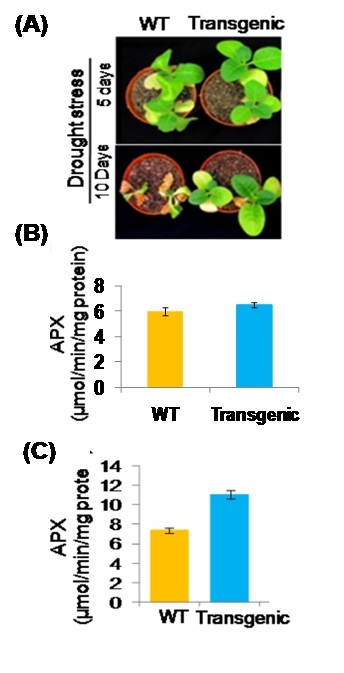 (B) APX activity in WT and transgenic tobacco leaves before drought stress treatment. (C) APX activity in WT and transgenic tobacco leaves after drought stress treatment. Figure 2. Protein extraction from tobacco leaves for measuring APX activity. (A) Set up for tissue crushing. Red, yellow, black and blue arrows show liquid N2 container, motor, pestle and ice container respectively. (B) Tissue homogenate after crushing. (C) Tissue homogenate after transferring to microcentrifuge tube. (D) Supernatant (Red arrow) and Pellet (Blue arrow) after centrifugation. (E) Supernatant containing the crude protein/enzyme after transferring to a fresh microcentrifuge tube. Figure 3. View of double beam spectrophotometer and cuvette. (A) Double beam UV-Vis spectrophotometer. Red arrow shows cuvette holder for reference and blue arrow shows cuvette holder for sample. (B) Quartz cuvettes used to read reference and sample absorbance. Figure 4. APX activity graph showing decline in enzyme activity due to depletion of H2O2 in unit time. Black line indicates the slope and blue arrow indicates the slope value. Proper maintenance of nutrient medium is required for plant growth in pots. Light, temperature and humidity should be maintained properly. If algal growth is observed on the soil surface, it can be removed by removing the algal layer along with the thin upper layer of soil with the help of a spatula. If it appears that soil surface is reducing after removing the algal layer along with a layer of soil, additional soil can be added to the pot carefully without harming the plant. Cuvette should be cleaned properly before use. Authors are thankful to Department of Science and Technology (Indo-Sri Lanka Program) and University Grants Commission, Govt. of India for the financial support. Authors acknowledge previous work published by Lakra et al. (2015), from which this protocol is adopted. Kumar, G., Kushwaha, H. R., Panjabi-Sabharwal, V., Kumari, S., Joshi, R., Karan, R., Mittal, S., Pareek, S. L. and Pareek, A. (2012). Clustered metallothionein genes are co-regulated in rice and ectopic expression of OsMT1e-P confers multiple abiotic stress tolerance in tobacco via ROS scavenging. BMC Plant Biol 12: 107. How to cite: Das, P., Lakra, N., Nutan, K. K., Singla-Pareek, S. L. and Pareek, A. (2015). Pot Level Drought Stress Tolerance Assay in Tobacco through Plant Phenotyping and Antioxidant Assay. Bio-protocol 5(19): e1605. DOI: 10.21769/BioProtoc.1605.